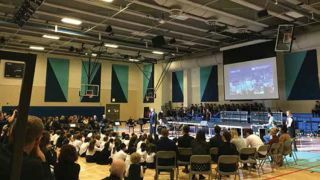 For the British International School of Chicago’s gymnatorium, Sound Production and Lighting utilized a dozen RCF C3110-96 speakers downfired from the roof joists, and they were able to zone the system into a number of configurations dependent on event and seating layout. The 10-inch two-way passive cabinets provided smooth coverage throughout the room. A main cluster of three Danley SH46 Synergy horns is designed to provide main coverage for the bleachers in theater mode. Zone control was handled through a Symetrix Radius processor, with a combination of Powersoft M Series and QSC CXD Series for power. Consider the smooth fusion in this word: Gymnatorium. Part gymnasium, part auditorium, it sounds like an architectural relic from the Roman Empire. Of course, it’s anything but. As K-12 schools embrace technology in both classroom and curriculum, this original flexible AV space is being redefined. The evolution not only calls for new technologies, but it presents challenges and opportunities for manufacturers and integrators alike. First and foremost, we should remember that gymnatoriums were not built for sound, but to house events of different types, from athletic contests to assemblies and convocations, said Ken Voss, manager of installed sound at RCF. Solutions over the years have been to downfire wide dispersion loudspeakers from the ceiling rafters and trusses covering the entire floor space, a center cluster disbursing sound throughout the entire room, or two lines of cabinets running along the roof aimed strictly at the bleachers on either side of the court, leaving it hard to hear during an assembly. “A critical issue in these types of facilities is the reverberant nature of the room itself, with hard floor and wall surfaces, high ceilings, and wood or metal bleachers causing acoustic reverberation that impacts intelligibility,” Voss said. The flexibility and highly reverberant acoustical nature of gymnatoriums can render them highly challenging spaces for audio system installations. Yamaha’s solutions include its TF digital mixer with One-Knob EQ, allowing an operator to achieve great results with very little knowhow. ATR Treehouse of Providence, RI installed a Yamaha NEXO M6 system and a TF3 console at Pilgrim High School in Warwick, RI. The flexibility and highly reverberant acoustical nature of gymnatoriums can render them highly challenging spaces for audio system installations. “Even experienced sound engineers can face challenges in providing intelligible audio in a space like this, so how can we expect students, teachers, or volunteers to achieve a great result?” said Marc Lopez, director of marketing for commercial audio products, Yamaha Professional Audio. Integrators could and should take advantage of new technologies that can be offered as value-added for a K-12 gymnatorium or cafeteria paging system retrofit. Some solutions to acoustical issues can be addressed in the initial design phase of the facility, said Ken Voss of RCF. Introduced at the Winter NAMM show, the new Harman Connected PA employs ioSYS technology in conjunction with the Connected PA mobile app to automatically identify and configure connected equipment. The app provides setup wizards for quick and easy system configuration, and offers access from a variety of devices, including iOS and Android tablets, Mac OS, and Windows. The Harman Connected PA brings together Soundcraft mixers, AKG microphones, dbx stage boxes, and JBL speakers that integrate Harman ioSYS technology to offer a flexible and scalable solution that makes it easy for customers to get great live sound.